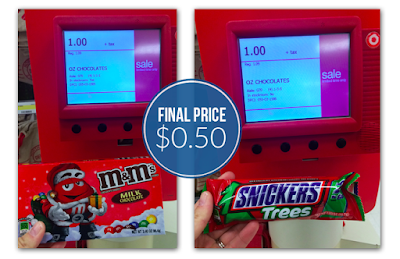 Clipping Chix: Target: M&M's or Snickers Chocolate Candies 3.4 oz box only 50¢ with Coupon! Target: M&M's or Snickers Chocolate Candies 3.4 oz box only 50¢ with Coupon! Match a printable coupon with a sale price at Target to pick up two boxes of holiday M+M’s for only $0.50 each! You can find these located in the seasonal section at Target. Total $1 or 50¢ each after coupon!